The Skylark airplane structure is made of metal of aluminum alloy profiles and sheets, designed as a self-supporting half shell, formed by bulkheads, spars, stringers and stressed skin. Strong and durable metal construction increases the level of safety and a long service life of the aircraft. Individual parts are connected by riveting duralumin, stainless steel pop rivets or rivets full of aviation rivets. Strength-significant connections are solved with screws and pins. Selected robustly significant parts and steel weldments are made from air-strength steel L-CM3. Strength-insignificant components, such as wingtips, engine or chassis covers are treated as fiberglass. In the middle part of the fuselage are in the cabin placed seats for two persons. The cockpit is covered by a one-piece hinged or sliding cover made of organic glass. The engine compartment is separated from the cockpit by stainless steel flame resistant partition with a possibility of additional soundproofing. We offer three levels of interior - sport / comfort / leather. Behind the pilot seats is located a luggage compartment with two side windows and capacity of 25 kg. The Cross section in the rear part of the fuselage is at the bottom rectangular with rounded corners, and in the upper part elliptical. An integral part of the fuselage is a keel with integrated mounts for rudder. 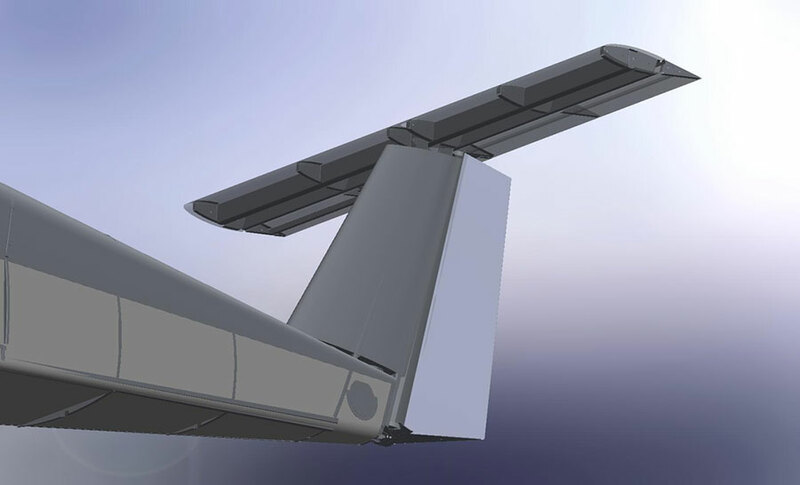 Trapezoidal wings are formed as single-beam with auxiliary spar on which are hinged ailerons and flaps. In the wings are placed integral fuel tanks of 2x45 liter fuel capacity, which are sufficient for a flying range up to 1200 km. In the left wing is placed a pitot-static airspeed system. The wing is composed of left and right halves, each connected to the fuselage by three hinges. The flaps are designed as tilting in the four positions. Negative position (-10 ° for travel and higher speeds), neutral position (0 degrees), the take-off position (+10 degrees) and landing position (+40 degrees). The wing ends with laminate winglets, which were designed in an aerodynamic tunnel. It has been designed by Prof. D. Marsden to reduce induced drag and improve wing rising speed. 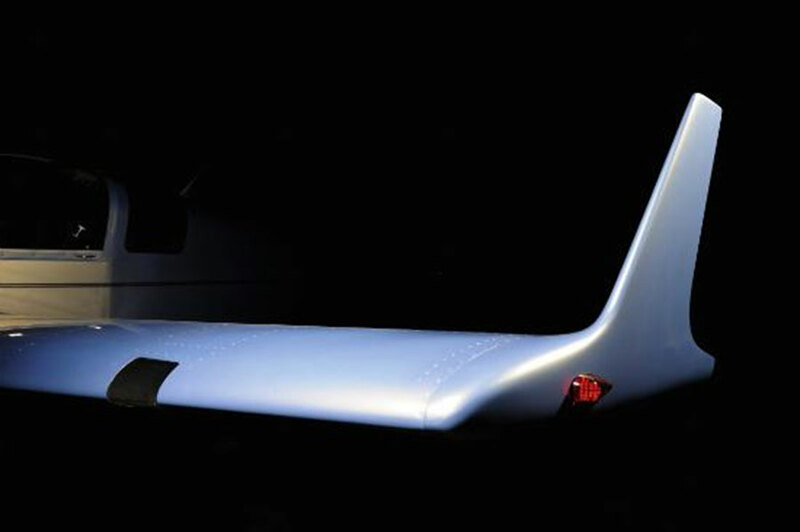 The left wing can be equipped with a halogen or LED landing light. Another option may be to replace the standard position light by a combination of position light and a stroboscope. The tail surface were designed as T-type, as an aerodynamic clean solution. It has lower aerodynamic drag and provides the pilot the control of the aircraft tilting without influence of propeller slipstream. The horizontal tail surfaces are made ​​up of a rectangular structure with a one-piece elevator suspended on the stabilizer. The stabilizer is mounted with four screws to the keel construction. On the left side of the elevator is on the hinge placed electrically controlled trim tab. The trim tab position is indicated to the pilot by an electrical indicator in the cockpit. To control the aircraft it is equiped with a standard switch, optional a multifunction switches directly on the stick. Trapezoidal rudder is hanging on the construction of the keel on two pins and it is controlled with stainless steel wires by pilot's pedals. The main landing gear struts are made ​​up of composite springs. Main undercarriage wheels are hydraulically braked. The braking system is a closed circuit with 6" alloy wheels. The aircraft is equipped with a disc brakes. Wheel is placed in a dural fork and it is controllable. We also offer a pulling fork for towing the aircraft. The main undercarriage wheels are equipped with wider tires for better stability. The front tire is less wide for easier controllability. Optional we can install fiberglass wheel pants.